CocktailMom: What time is it? After our friend,Carsen, came to visit I knew exactly what I'd make her for her 5th birthday. Many times throughout the trip Carsen would ask "what time is it? ", "how much longer?". Questions like these are a sure sign that your child is ready to start learning how to tell time. 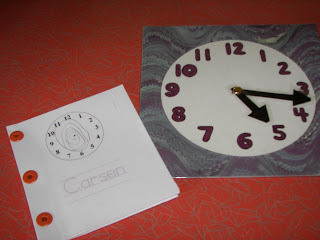 So I made Carsen a clock, printed on cardstock and laminated with moveable arms. I then made her a book with a blank clock on each page that she can draw the hands on for the time of the activity, which is printed on the page for her to trace. Oh I love things that teach more than one thing at a time and the kids don't even notice. Hi! I really love the fabric chalkboard that you posted on February 21st and was wondering if you minded if I used the picture (with your information and a link back to your blog) in a upcoming post next week? I just love the colors in that pic and I love that someone found a different way to do a wall chalkboard.